Seriously, why do they keep putting out trailers for The Commuter? Liam Neeson punching people on different forms of public transportation is a genre unto itself, and frankly you probably knew if you were going to see this months ago. And yet here we are with another that gives away new footage when I'm sure there isn't much to spare, and recycles stuff we've seen that was kinda hard to discern from other Neeson movies. If they mixed in footage from Non-Stop would any of us know? 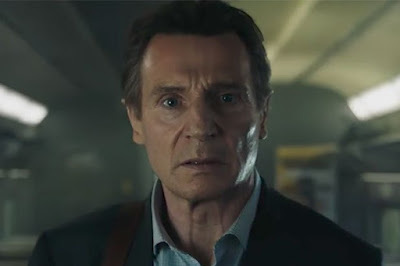 Once again enabled directed by Jaume Collet-Serra, who has worked with Neeson on multiple similar-looking films at this point, the story follows a regular guy who stumbles into an action-packed conspiracy while the commuter train from work. So you get Neeson racing from train to train, by leaps and friggin' bounds like Superman, and screaming for the train to stop like he was Sylvester Stallone in Stop! Or My Mom Will Shoot. Honestly, this will probably be perfectly fine and forgettable. It just didn't need this one final trailer. Also starring Vera Farmiga, Patrick Wilson, Sam Neill, and Elizabeth McGovern, The Commuter opens January 12th 2018.